The Infant Sportster is 1.2 MB. Larger files take longer to load. This is the Infant Sportster listing page, here you can download the plan, article and see the main thumbnail and extra images. 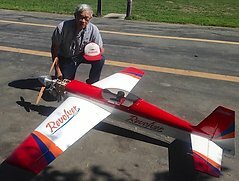 "Infant Sportster" is a sport free flight model designed by legendary William "MAN at Work" Winter, the longtime editor of Model Airplane News magazine in the 50s and 60s. Published in 1949, the plane was designed for one of the smaller, then-new, glow plug engines, the K&B "Infant" .020. As that particular engine has long ago "dropped out of sight", a more reasonable power plant today would be a small electric motor, brushed or brushless; a Speed 400 brushed motor would be fine, along with lightweight r/c controls for rudder, elevator, and throttle. As published, the Infant Sportster's nose is quite short which would make proper balancing a real challenge; extending the nose by 1" to 1 1/2" would provide sufficient margin to handle proper balancing. 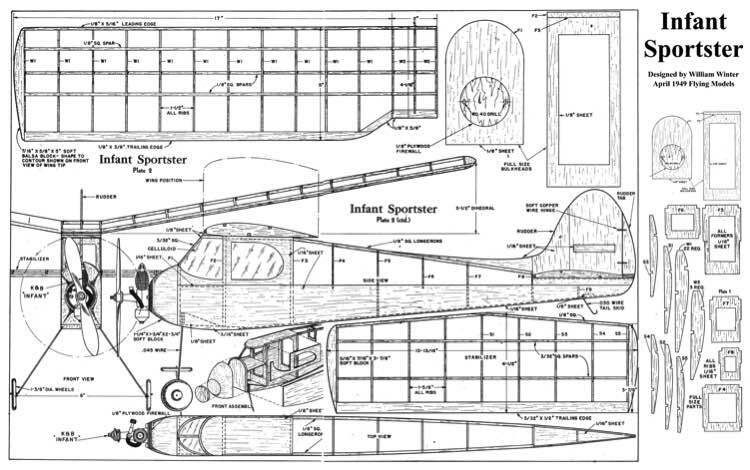 These are the details for the "Infant Sportster" plan. If you would like to become a plan editor and help us to edit the attributes of all the plans in the website please click the "Edit Attributes" button below. Order your Infant Sportster prints today! The Infant Sportster plan can be printed on plain paper, tracing paper or polyester film and shipped worldwide. This tool allows you to calculate the cost of printing and shipping the Infant Sportster plans and its building article if available. If you need to resize a plan please contact us with the ID:82016 and the desired wingspan. I will calculate a price upon request, please contact me here mentioning this PlanID: 82016 and the job you wish me to do. This plan is 1.2 MB and was shared by our member aeroastro on 28/03/2015 20:17 in the PDF Bitmap Wood Model Airplane Plans (1) category. It has been downloaded 49 times.